After overwhelming response received in the first scholarship event, Desh Bhagat University is organizing the next scholarship event between 23rd May and 25th May in the campus and the cause for the same is the great demand from students. This event is going to benefit all students aiming for admission in different courses. In this 3 day long programme, University is offering fee waiver up to 100% for the eligible students of SC/ST category. There are many scholarships which the University is already offering to the eligible students. Education to Girl child is the primary focus of the University and so is the reason every Girl child is offered Shakti scholarship which will give the benefit of 50% concession in the fee. Another major scholarship scheme is Dr. Z Scholarship scheme for the academically brilliant students. 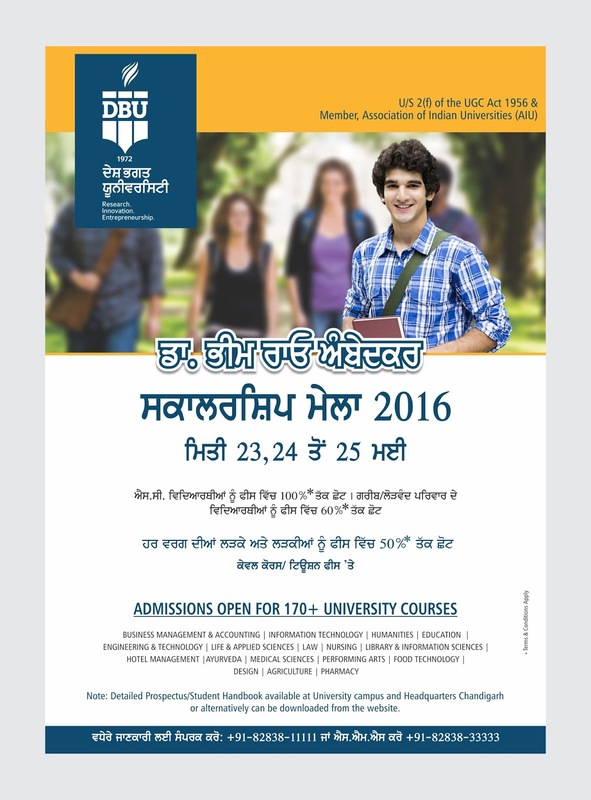 The students may take admission in their desired courses or get seats reserved before it is too late. Briefing about the event, university Chancellor Dr. Zora Singh said that education is our fundamental right and to ensure that even the weakest of the weak are able to get higher education, the university has instituted a number of scholarships and concessions for the needy students. He expressed the hope that this Special Scholarship Fair will prove a blessing for the students. Vice President, Desh Bhagat United Er. Sandeep Singh exhorted the needy students to take full benefit from this Scholarship Fair and fulfill their dreams by getting higher education which is time and market relevant. He said that Desh Bhagat University endeavors to bring social equality through education and it is moving ahead in this direction with sincerity.